Equipped with features that are not available on most competitive units, the RKI EAGLE is a powerful instrument that does more than just offer the standard confined space protection for LEL, O2, H2S and CO. Detection combinations never before offered in a portable gas monitor are now available featuring the industry’s widest selection of high quality, long life and field proven sensors. With its ergonomic design and large glove friendly buttons, the RKI EAGLE offers easy access to controls such as autocalibration, alarm silence, demand zero, peak hold and a wide variety of other features. Each channel has two alarm levels plus TWA and STEL alarms for toxic channels. The two alarm levels are user adjustable and can be latching or self resetting. 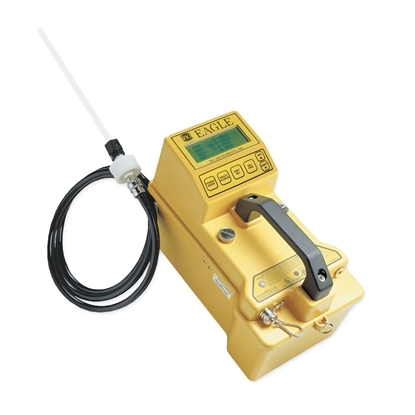 Rugged, reliable, easy to operate and maintain, the RKI EAGLE is the solution for just about any portable gas monitoring situation. The EAGLE can be ordered with up to 6 gas sensors. Please specify the gas combination when ordering. All versions listed below are supplied with alkaline batteries, and include a hose, probe (if applicable; not used with some versions due to absorption reasons), shoulder strap, instruction manual, and training CD. Many versions also include an internal hydrophobic filter as standard (for versions where the internal hydrophobic filter will not t, it will be provided externally). For Ni-Cads, charger, data logging, larger internal hydrophobic filter or other accessories, please review the notes below for these optional accessories.